Sydney has very short winters. Really, there are only about six to eight weeks of the year when it is really, really cold. This year, winter was slow to start, we had a long hot, hot summer which lingered well into early May, so it now seems like winter has barely begun and it already feels slightly warmer, as if we are edging into spring. For those who don’t like the cold, this may seem like a good thing, but I’m still experiencing a bit of post-traumatic stress from the heatwaves of last summer. I’ve been enjoying the cool weather and after whinging about the extreme heat all summer, it would be narky for me complain about a bit of a chill in the air. Now with our too fleeting winter almost at an end, I’m thinking of all the winter food I should have posted on and which I just haven’t had time to. Cauliflower is one of my favorite winter vegetables and I haven’t posted one cauliflower recipe. 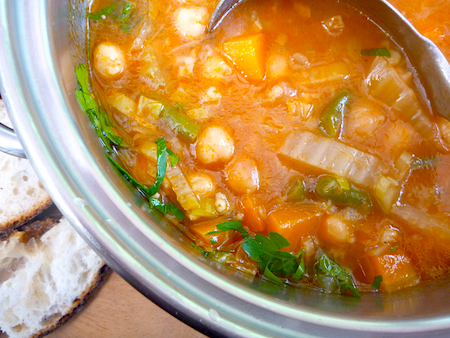 But one of the main reasons I love winter food is… soup. How good is it, so easy to make a big pot of it, and it keeps for days in the fridge (in fact, it just gets better). Then if it all gets too much, you can freeze batches of it for a quick weeknight dinner down the track. My son loves this soup. The secret to its awesomeness is in the cooking of the chickpeas with a whole heap of salt and olive oil, an idea I got from Nicholas Day’s blog over at Food 52. I was a bit dubious about putting so much salt in the chickpeas at the start of the cooking process, I thought it would make them tough but it doesn’t. Actually, it makes them super creamy, buttery and deliciously meaty. This is now my son’s favorite soup, after French lentil and onion soup. 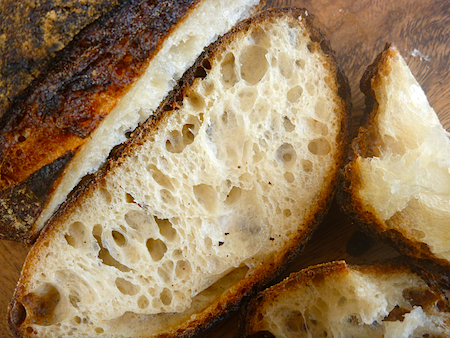 The rich broth is perfect for dunking bread in and we’re big bread-in-soup-dunkers in our house. 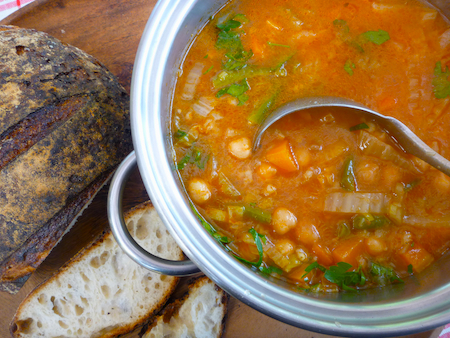 I made a big pot of this soup last Sunday and we ate it for both lunch and dinner. A friend came over to visit and brought a couple of loaves of Iggy’s bread (the best sourdough in Sydney), which we ate with the soup and a perfectly ripe brie. We also baked off some gingersnap biscuits from the dough I had in the freezer and, along with copious cups of tea, it was a perfect winter’s day of feasting while we watched the footy (the Swans!) and my friend taught me how to crochet. Even though I’m the most un-crafty person in Australia, I’ve been wanting to learn to crochet for about six months, ever since I developed a unhealthy Pinterest addiction and kept pinning all these granny rugs over and over again. 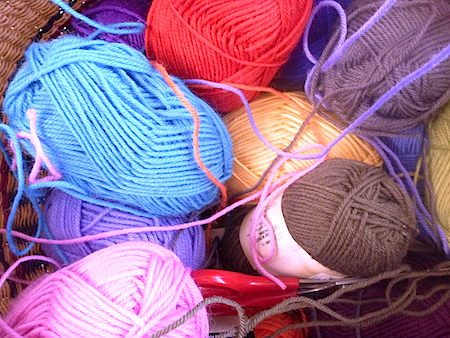 All that Pinspiration made me determined to learn to crochet and last weekend, I went out to Spotlight and bought a whole heap of wool on sale. For the bargain price of $24, I got enough wool to crochet an entire rug. 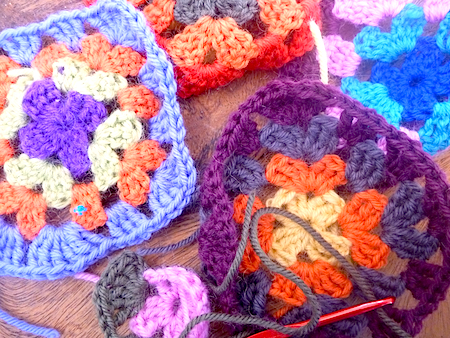 Although I’m just crocheting the most basic of granny squares, I’m really excited. Even for the non-crafter like me, crocheting is dead easy. 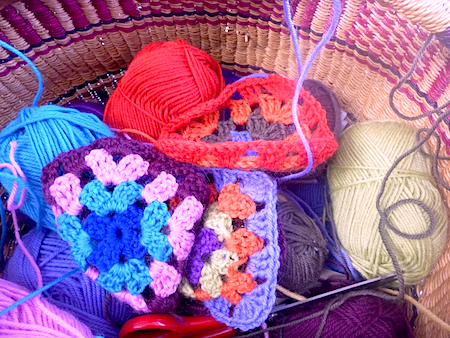 And soon, I’ll have enough granny squares to make and an actual, live, non-virtual rug that’s practical and beautiful. I’ve been crocheting for less than a week but I’m now officially a convert to the powers of crochet, it really is very relaxing and calming. It’s something about the repetition, the need to remain equanimous so your tension remains even, to calmly unravel when you make a mistake and pick up and start again. It’s like a meditation. 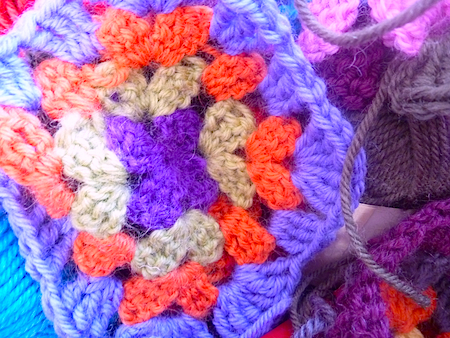 I plan to spend the rest of our all-too-brief winter eating lots of soup and crocheting granny squares. There is also the added bonus that after our former Prime Minister, Julia Gillard, got derided and ridiculed for being photographed knitting for a women’s magazine – any public displays of the traditional feminine crafts seem like a subversive feminist act. I’m still feeling very saddened and angry by the way our first female Prime Minister was treated by the media and political commentariat. Now the blokes in blue ties are firmly back in charge, it seems like it will be a long, long time before we get to experience another female Prime Minister. I’m feeling very nostalgic for what both what was and what could have been under Julia Gillard’s leadership, so I’m posting a link to our former Prime Minister’s misogyny speech, which I think was one of her finest moments. Remember, this woman was unmarried, an atheist, kick-arse political warrior who knitted. She broke the mold for political leadership and, although she was subjected to the most unrelenting abuse we have ever seen in Australian politics, she never ever lost her poise, dignity or, indeed, her equanimity. Soak the dried chickpeas in plenty of cold water overnight. Drain chickpeas and place in a large pot with at least ten cups of water with herbs, garlic, carrot, celery, onion, Parmesan rind, olive oil and salt (do not skimp on the olive oil or salt). Bring to the boil and simmer very gently for one hour or more, until chickpeas are tender. Do not drain the broth off the chickpeas but fish out the vegetables and Parmesan rind. As this makes an awful lot of soup and my freezer space is limited, I often divide the chickpeas and broth in half, freeze one half to make soup later and just make a half batch of soup. The ingredients that follow are for the full batch though. 2 leeks (optional, but for me nearly every soup is improved with the addition of leeks). 2–3 stalks of celery diced. 2 cups of sliced vegetables (the original recipe calls for kale but I usually just use whatever vegetables I have around. For this particular soup, I used a quarter of Chinese cabbage I had leftover and some green beans… and it was delicious!). ¾ cup of pearl barley or farro (optional). 1½ cups of tomato puree, tomato passata or if I have some leftover tomato pasta sauce I throw that in as well. 2–3 tablespoons of olive oil. If you are using the farro or barley, bring a small pot of salted water to the boil and add grains. Cook until tender (15–20 minutes) drain and reserve barley water. Heat olive oil and very large saucepan, then add diced onions, carrots and celery. Saute until soft, then add leeks and garlic and saute until leeks have sweated down. If using tomato puree or passata, add to onions and veggies and cook for a few minutes. Then add chickpeas and broth, tomato pasta sauce (if using). Add the barley broth or more water if needed and bring to a simmer. Cook for about ten minutes, then add vegetables like beans and cabbage. Simmer until vegetables are almost done, then add cooked barley, simmer for another five minutes before letting the soup sit with the lid on for five minutes before serving. As I find this soup hearty and sustaining enough by itself, I usually just cook up a small amount of soup pasta, put it in a bowl and pour some soup over it for those (like my son) who find it necessary. Serve with freshly chopped parsley, grated Parmesan and chilli flakes. « Winter delights – Swedish ginger thins with blue cheese. PS The chocolate and pistachio cake has now been baked in a casserole dish (we were without a tin), baked in an oven that got turned off half way through and carried in a backpack over a rough track as well as a ferry trip and in each case it survived and triumphed! I would love to live in a place with short winters. I dread winters especially when the roads are icy and full of snow. I love minestrone, but I always add some bacon in mine. Gives it a much better flavour. Thanks for visiting my blog. Wish you a lovely weekend! 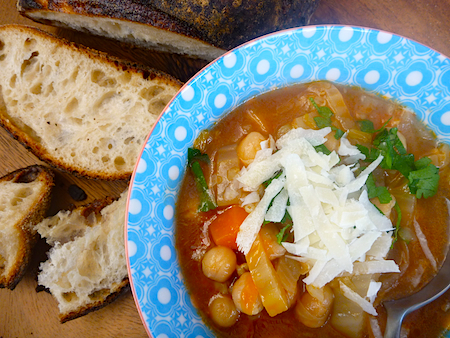 Minestrone soup used to be the only soup I would make before I had a food processor – this has reminded me how much I love it and the addition of the chickpea looks delish! Will have to try it out! My son doesn’t like the creamed soups so I have to generally make the brothy soups now. A pity because I like a nice pumpkin soup. This looks great! We love chickpeas. Visiting from Meatless Monday.